It looks like ReSharper finally came out with the 4.0 beta that's compatible with VS2008. My colleagues have been pushing toward CodeRush and I intend to learn just better understand what it can do. I did a quick search and found this "smackdown" comparison between the two. Bummer that they don't play well together. Tomorrow there are a couple of Live Meetings on the new .NET 3.5 and Visual Studio 2008 certifications. Check out the link to see the 3.0/3.5 topics for which you can now get certified and some detail on the specific exams. Enjoy! I'm a huge fan of Agile principles and applying them to organizational challenges other than just software development. 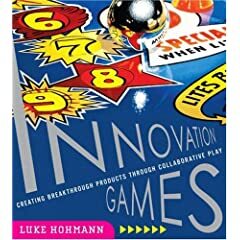 For other like-minded hippies, you may be interested in a class on Innovation Games being taught in Austin by my good friend Luke Hohmann, CEO of Enthiosys. We practice Luke's Innovation Games now and then at Improving to overcome blocks in managing a product backlog or just developing one. If you haven't read the book, I encourage you to check it out or sign up for the course. It's a great set of tools to have in your agile toolbox. Yesterday I chatted with Erik Weibust over at the Java Spring User Group and he told me that Keith Donald, a founding partner at SpringSource and famous for creating Spring Web Flow, is speaking at the May meeting at Improving tomorrow night, Wednesday May 20th. The meeting starts at 7:00p and the doors to the building lock at that time, so get there a little early. For those of you in the .NET world, SpringSource has released a version of Spring .NET, which is a full-featured open-source IOC framework for .NET. I'm looking forward to hearing Keith speak. Erik says he's very engaging. This weekend I had the pleasure of attending and speaking at the Tulsa School of Dev. While there, I got to catch up with my long-time friend, Brett Schuchert. Brett is quite the programming language buff, and knows the C++, Java, and C# inner workings very well. We got into a discussion about virtual tables being constructed at compile vs. load time and he asked if I had heard of any advances in the newer versions of .NET. But as I recalled (and have now verified), .NET v3.0 and v3.5 both run on the same old .NET v2.0 CLR. We'll have to wait for a CLR change to optimize the virtual tables. I'm here at Microsoft listening to Jef talk about LINQ internals at the Dallas C# SIG meeting. Since I love to multitask, I wanted to take the opportunity to post this link to free eBooks for LINQ, ASP.NET AJAX, and Silverlight. I've only started reading the LINQ book, but really like it so far. Fair warning: you need to have an MCP number to register and download these eBooks. But of course, if you want to become a Microsoft Certified Professional, contact Improving for training and "second chance" exam retake coupons.